It's almost my birthday and you know what that means! I only write about what I want to and totally ignore your requests for a few days! (I'm pretty darn good at accommodating you folks the rest of the year. Let me enjoy myself.) This week we shall be focusing on one of my all time favorite extant animals with a really interesting prehistoric story twist. We are going to talk about salamanders. My pet Iranian Kaiser Newt. (Neurergus kaiseri) In my opinion this genus is one of the most beautiful species of amphibian. It gives dart frogs solid rivalry. Salamanders one of my favorite living animals. I'm not exactly sure specifically why but I do know that I decided they were one of my favorites at a very young age. I remember I found my first Red Back Salamander when I flipped a dead log over in the woods near my house. I was hooked ever since I suppose. In fact, I keep several different species of salamanders in my home as pets. They are not necessarily the most popular kind of pet amongst the masses (even in the reptile/amphibian pet trade) but they are certainly my favorite. Oh and for the record, please don't confuse salamanders with lizards. They have the same body shape but are totally different animals. Salamanders are amphibians (soft, absorbent skin, related to frogs, mostly lay squishy eggs that need to stay wet) and lizards are reptiles. (dry scaly skin, related to snakes, mostly lay shelled eggs on land) Totally different animals. 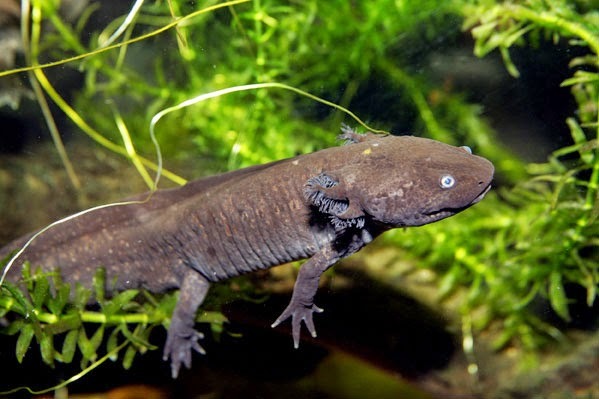 One amazing thing about salamanders is that they are the only tetrapod that can regenerate limbs and other parts throughout their entire lives. (A tetrapod is a vertebrate that has four limbs, or evolved from ancestors with four limbs. This includes amphibians, reptiles, birds, and mammals. Yes, snakes and whales count as tetrapods.) Certain kinds of lizards can regenerate tails but salamanders can regenerate tails, legs, arms, eyes, organs...pretty much anything that doesn't kill the animal. It is because of this that salamanders are currently the subject of much medical research. Imagine in the future if we could regrow our body parts thanks to an amphibian! Axolotl. A large fully aquatic salamander native to Mexico. They are pretty much extinct in the wild due to habitat loss. They are extremely common in captivity, however. This is one species that is currently being researched for medical purposes. Well, paleontologists in Germany discovered that this ability to regenerate body parts goes back a lot farther than we previously thought. It turns out that amphibians were regenerating arms and legs 300 million years ago! They weren't salamanders, either, but a now extinct kind of amphibian, called a temnospondyl. The genus of the animal, itself, is Micromelerpeton. Micromelerpeton is known from many wonderfully preserved fossils. Scientists noticed that some of these individual fossils showed strange arrangements and proportions in the hands and feet. When compared to data about modern salamanders, it was discovered that these odd bones (some were too small, some were fused, some were too numerous in the hand) actually reflect an animal that is in the process of, or recently regenerated that limb. This also means that the ability to regenerate these body parts evolved much earlier on the amphibian family tree and was lost by all the modern kinds except for salamanders. Frogs, for instance, can only regenerate body parts when they are tadpoles and lose the ability once they reach their adult forms. Salamanders, however, can do it throughout their entire lives. image from Frobisch's paper showcasing fossilized remains of Micromelerpeton hands in the process of regeneration. As if that wasn't interesting enough, before I go I want to share with you something amazing! Like I stated, I keep many salamanders for pets. Amongst them I have two Hong Kong Newts. (Paramesotriton hongkongensis) They are beautiful little creatures. A few months back I noticed something was wrong with one individual's left arm. It was turning white and appeared to be deteriorating. I was worried this might be the result of an infection of some sort. Infections are bad for amphibians because they spread especially fast and can be passed to other individuals as well. Luckily, since I work at a zoo, I already know a great veterinarian who works with exotic animals and immediately set up an appointment one afternoon. He examined the little fellow and told me that luckily it was not an infection, just trauma. (Probably from a fight with his tankmate. They go into frenzies during feeding time and tend to bite anything that moves, including a neighbor's arm.) He decided to amputate the whole arm. I was then on antibiotic duty (lol dooty) for several weeks. At that point I was aware that salamanders could regenerate limbs, but I honestly didn't really consider that this guy could. Well only a few weeks later I noticed what looked like loose flap of skin coming off of my newt's arm stump. I looked more closely and was amazed to see a teeny tiny baby-sized hand had emerged from where the stump was! He was regenerating! I had never witnessed it in person before and always assumed the new arm grew back to match the size of the animal. It was cool to learn that it actually starts as a very small, basically fetal stage, and grows to match the rest of the body! How cool is that?!?!?! Here are some photos I took of his regenerating hand. From now on they are each fed in separate containers and given time for their feeding modes to wear off to prevent any future biting incidents. That's all for today! Hope you enjoyed a little peek into my somewhat private life of amphibian keeping. Stay tuned for Sunday for a beloved Prehistoric Animal of the Week! Frobisch, Nadia B., Constanze Bickelmann, and Florian Witzmann. "Early Evolution of Limb Regeneration in Tetrapods: Evidence from a 300-million-year-old Amphibian." Proceedings of the Royal Society 281 (2014): n. pag. Web.